This is an elegant small to medium sized deciduous tree that may be single or multi-trunked. The dark green pinnate leaves turn yellow to red to purple in autumn. 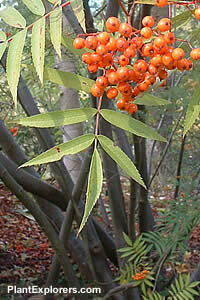 White spring flowers are followed by bright orange-red berries. Height 30 feet; spread 22 feet. For maximum freshness, please keep seed refrigerated in its original packaging until it is time to plant. Germination appears to be best when the seed is sown in a moderately sandy soil in the autumn and left in a coldframe for the winter. Seed may also be planted in the spring, but should be sown in small pots and refrigerated for several weeks before being placed in a coldframe to complete their stratification. Grow in moderately-fertile, humusy, acidic to neutral well-drained soil in full sun.